Which Languages Are Parts Of The Indo European Language Family? 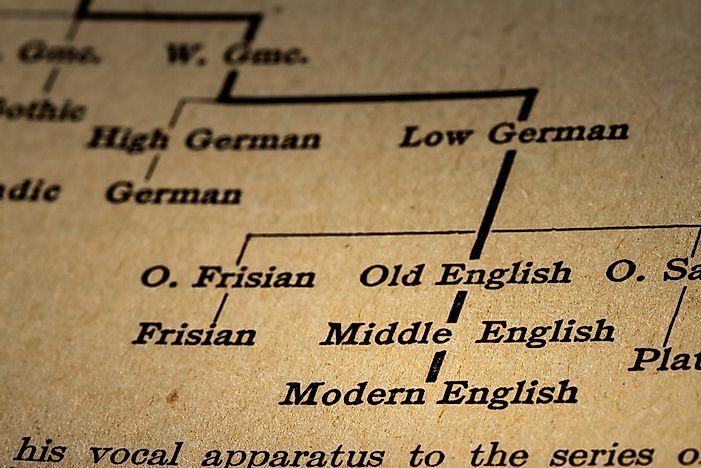 Nearly 500 languages can be linked to the Indo-European language family. A graph showing part of the graph of Indo-European languages. Editorial credit: Benoit Daoust / Shutterstock.com. It is estimated that almost 3/4 of the world’s countries use an Indo European language as the formal tongue for communication or sole language. The dialects are among the most spoken languages in the world today and approximately 3 billion speakers use it worldwide. The Indo European family of languages consists of English and a host of other European dialects. It also includes Persian and Hindi dialects. There are contradictory theories as to how the language came about but research shows that it was first spoken by a community people who lived approximately from 4500 to 2500BC. The language then was known as Proto-Indo- European or PIE. Interestingly no written text has been found and the sound of the original dialect is also not known. The most recognizable Indo European languages include Celtic, Armenian, Germanic, Italic, Baltic, Slavic, Albanian, Hellenic or Greek, and Indo-Iranian among others. The language is spoken prominently in Europe except for countries such as Hungary, Finland, Estonia, Turkey, Georgia, and Azerbaijan. It is also present in parts of the Middle East such as Iran and Afghanistan, and also Asia in countries such as India, Pakistan, Bangladesh, and Sri Lanka. Indo European languages are also present in American continent, Oceania, and sub Saharan Africa. Linguists say the language was first spoken in Eurasia and spread to the entire world over a period of 6,000 years. Indo European has been placed in history in the period preceding the invention of farming because some of its ancient words are related to farming activities. It is subdivided further into nine subgroups which include Indo-Iranian languages, Armenian, Greek or Hellenic, Albanian, Italo-Celtic languages, Balto-Salvic languages, Germanic languages, Tocharian, and Anatolian. Bernard Sergent updated the classification of the language in 2005 in an effort to support other classifications carried out before him. Sergent categorized the language into five broad sub classes as Northwest group, Southeast group, Anatolian, Indo-European with undetermined status and hypothetically Indo-European languages. Research shows that there is a common origin for languages covering a vast linguistic and geographical range in the world. Languages such as French, Greek, Hindi, and Persian have many similarities which suggest they are related to each other. Early Proto-Indo-Europeans are believed to have left their ancestral land in 3000 BC and migrated to different directions. The first well documented Indo European language was Hittite language which was spoken in Anatolia and its people occupied the Hittite Empire. Other arms of Indo European spread further outwards over the years such as Balto-Salvic speakers who established themselves in Baltic and East European region; Greek speakers covered Greece and the language further divided into Celtic, Italic, and Germanic languages. Some languages are presently extinct such as the Tocharian language which was spoken by people who settled in China. Indo European is wide spread across the world where in India it is spoken as Sanskrit and in Iran as Persian. Indo European language has the most native speakers worldwide with prominent languages being English, Spanish, French and Russian.